What they don’t say is that 62% of those are suicides, almost all of which are committed with legally acquired handguns (no assault weapons or extra capacity magazines required). The common retort is that if America had fewer guns, there would be fewer suicides. Yet a brief examination of international data shows this to be utter buncombe. 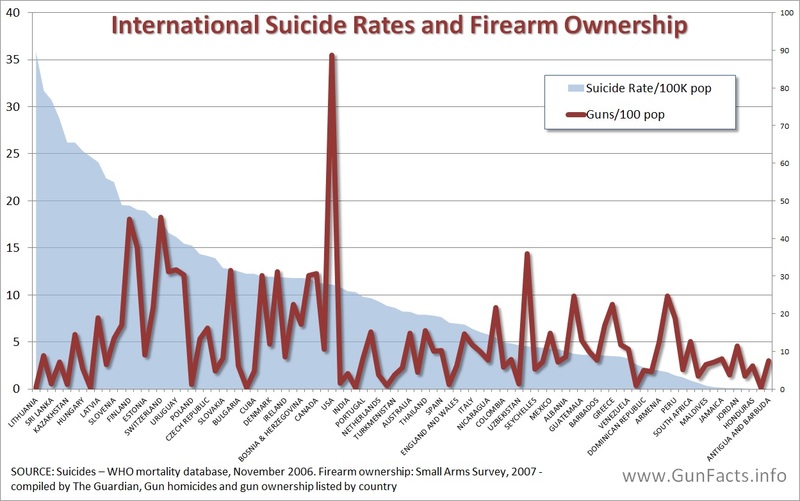 The World Health Organization (WHO) tallied suicides around the globe, and the Small Arms Survey estimated private gun ownership rates. WHO also noted how people exit this life when it gets too rough for them. The chart to the right pretty well debunks that guns are the determinant variable for suicides. The United States has way more guns than anyone else, yet their suicide rate is not terribly higher than international averages (11.1 suicides for every 100,000 people, versus the global average of 10.0). We would likely rank even better if we could ignore happy-go-lucky lands like the Bahamas (1.3) and Antigua (zero). Since culture plays a big role, comparing American and Canadian suicides is compelling. We share many historical origins and cultural traits. Because of this our suicide rates are nearly identical (American has 10.1 suicides per 100,000 people and Canadians with perpetual seasonal affective disorder are higher at 10.4). However, Canadians allegedly have about 1/3rd the number of firearms as Yanks. Were guns a cause for suicides, Canucks would have 66% fewer. The other way of looking at the situation is to compare America to the most suicidal place on the planet, Lithuania (35.9 suicides per 100,000 folk). Guns don’t make Lithuanians more suicidal because they own only 0.8% as many guns as we do. But they do evidently own a lot of rope, because that is their favorite form of suicide. Which brings up an interesting study of Australian suicides. 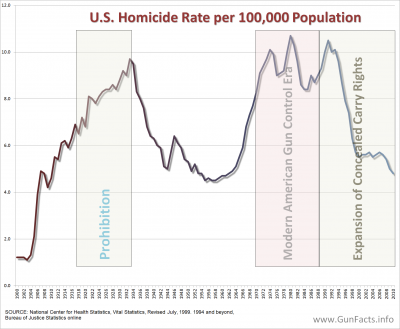 As we know, Oz has endured several spurts of gun control measures which lessened availability of guns. One handy study 1 is a compelling time series review of how gun availability has no bearing on total suicide rates. In their review period, total suicides increased which firearm suicides decreased (men started hanging themselves much more often). Since guns are not the determinant variable in 62% of American gun deaths, then we need to look for real solutions. If the Brady Campaign is serious about ending gun deaths, then they should change to being a mental health advocacy group. Thank you for writing this article. I think many of us already knew that the mere presence of a firearm does not suddenly create an irresistible urge to use it on ourselves. I had read an article about the effects the gun ban had in Australia (the conclusion of that article was much in line with the conclusions posted on this site just recently). Prior to the ban, the rate of suicide in Australia was on a steady decline. 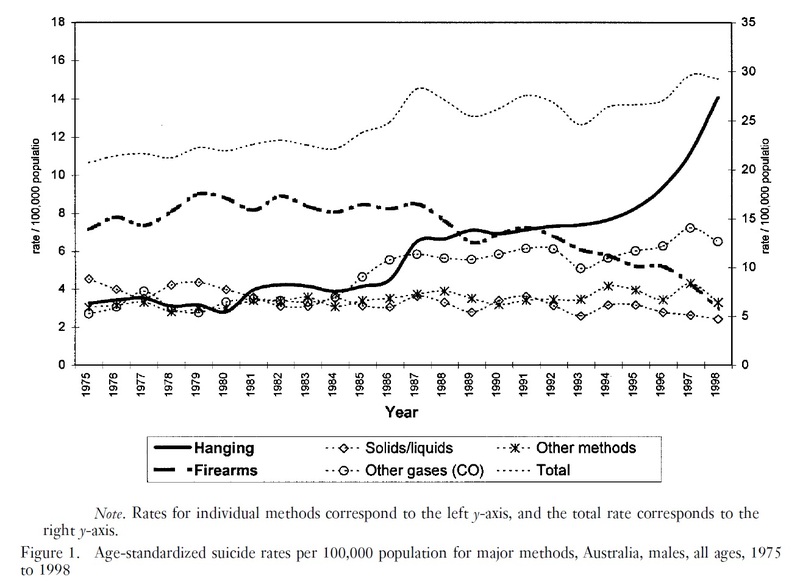 After the Aussie gun ban, the rate of suicide by firearm began to decrease more rapidly. I was a bit surprised, but then read that the rate of suicide by other means actually increased, offsetting the lives saved from the gun ban. Bottom line…guns do not drive people to suicide – it’s a mental health issue. And if someone is that determined to kill themselves, they will find a way, even if no gun is available. As a mental health professional and gun owner, I can tell you that there is a serious problem of older white males in committing suicides with guns. Some rural states have started programs wherein friends will reach out to friends during times of crisis and ask to temporarily store the firearms at their house, somewhat akin to “friends don’t let friends drive drunk”. I think all gun owners need to be educated about the signs/symptoms of depression and how to do interventions. Thanks for the note, and your suggestion for storing guns for other people is wise (I know of someone going through a tough divorce while young who surrendered his guns to friends for the duration). I did a quick check at WISQARS, which provide an metro/non-metro breakdown, which is a rough proxy for urban/non-urban. I ran the numbers for white males over age 50. The overall suicide rate (regardless of means) is higher for non-metro areas (see table below). I believe that the general lack of daily human interaction in rural areas (isolation) is a chief contributing factor for the desire to commit suicide, and that since rural people have a high gun ownership rate, it is their means of choice for committing the act. A good contrast (and I do not know where to find the numbers) would be with Canada, which has vast stretches of rural lands and a lower national gun ownership rate. I have a hunch (and it is only a hunch) that we would see similar ratios for overall suicide rates given the historically similar suicide rates of the two countries.